Challenges are designed to push you to the limit of your skill, nerve, and will to win. But be warned, as the money on offer increases, so does the difficulty of the games. They may seem simple, but under the studio lights, with a hushed audience and a substantial prize sum at stake, an apparently easy task becomes a dramatic test of nerve. You are given two bonus choices. One is a ‘trial run’ giving you a practice go with nothing at stake and one is the chance to ‘simplify’, used at any point during game play to make the game easier. Practice Mode – individual games always played at the Standard level. * money ratings shown during Challenge mode are illustrative only. No cash prizes are offered for playing this game. 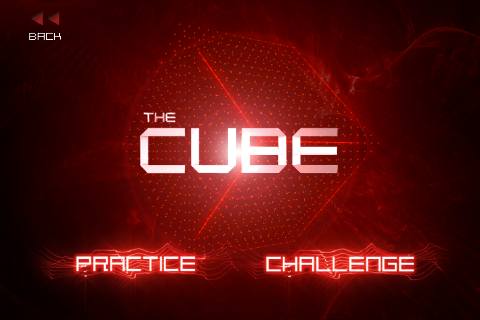 The Cube game will judge your performance based on a comparison with other players. 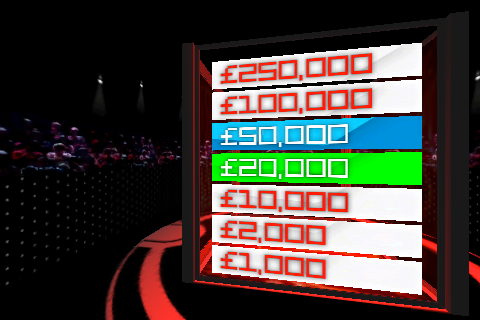 The Cube game records universal, anonymous statistics for each challenge played successfully. You will be judged on Accuracy, Time and Attempts, giving an average rating with a total of five stars. 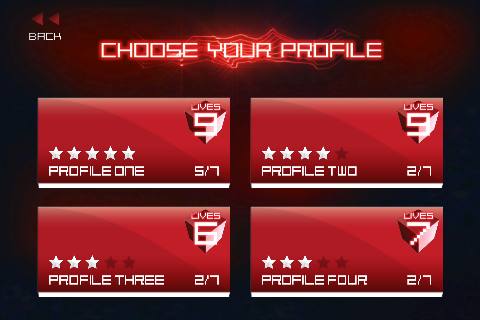 Compare favourably with fellow players and you will be rewarded a high rating. Perform poorly and The Cube will penalise you. Remember as other players improve their statistics, The Cube will adjust your ratings accordingly. Practice and Challenge modes are judged separately, as is each game level (Simplified, Standard and Final Round). Practice games are always played at the Standard level. Disclaimer: For the purposes of comparing your score with other users your device will connect to our servers periodically. When doing this we collect no personal information, no information that would enable us to personally identify a user and no information about the user’s device. 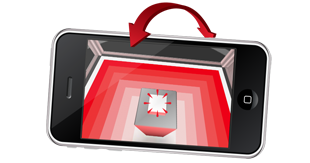 Think of your device as a window into The Cube. 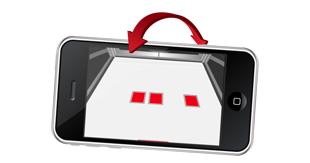 Much like if you are taking a photograph, to look at the floor, point your device at the floor. To look at the ceiling, point your device toward the ceiling. 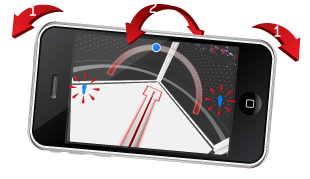 To turn left and right in The Cube, tilt one side of your device down, as if it is a steering wheel. The further you tilt, the faster you will turn. 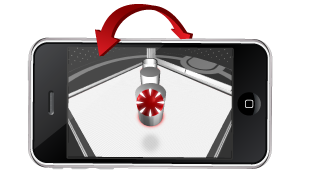 To stop turning, return your device to a flat position. Using this method, you should have full control to look anywhere in The Cube. You may find yourself holding your device slightly differently than with other games, more like you are taking a photograph than holding it in your lap. Walking about inside The Cube is simple. 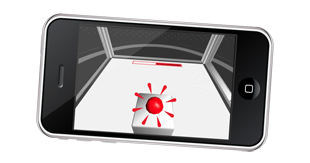 When a game requires you to walk around, a large black and white circle, called a 'thumb pad' will be shown in the bottom left of your screen. We find it easiest to control this with our left thumb but you can use a finger if you like. Place your thumb or finger on the screen in the centre of the thumb pad. This should have no effect. Now move your thumb slightly to the left or right, keeping it on the screen. 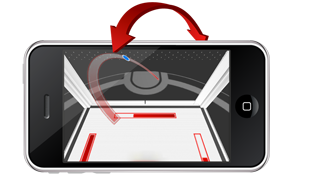 The thumb pad will move slightly to show that you want to move in that direction. You should see your view start to move in the direction you moved your thumb. You can move forwards and backwards also. To move faster, slide your thumb slightly further away from where you originally placed it on the screen. To stop moving, either slide your thumb back to it's starting position, or take it off the screen completely. If you have slightly larger hands, you may find it easier to "rock" your thumb/finger on the thumb pad instead of actually moving it. 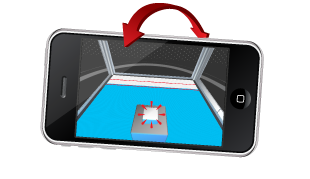 Using a combination of tilting your device (looking) and dragging the thumb pad (walking) you should have full control of your virtual body inside The Cube. 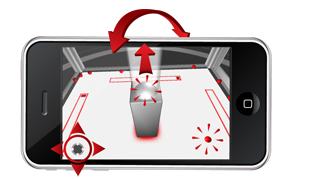 Many objects in The Cube can be interacted with. This includes balls and buttons. Interacting with an object is usually a case of just touching it. For example, to drop a ball, just tap it. To trigger a button, tap it. Some balls can be thrown using a 'swipe' gesture. 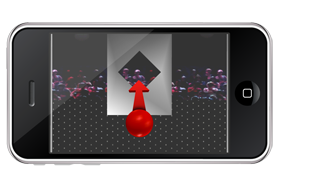 Here, you place your finger on the screen over the ball, then move your finger in the direction you wish to throw then finally take your finger off the screen to complete the throw. 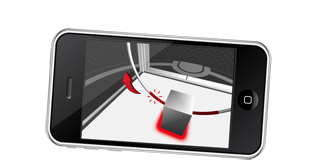 Because The Cube Game is designed for iPhone and iPad, iPad users may find they need to swipe further on the screen than they may expect. Generally a longer, slower swipe is more accurate than a short, quick one. 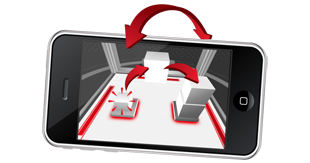 When you need to interact with a game object, the instructions for that game will explain how. 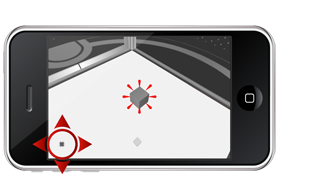 To see the instructions, tap on the "Tips On How To Play" button that appears during the game intro. Many games also have useful hints. Everybody uses their device differently. It may take you a little time to find the method that works for you, so please experiment. You aren't penalised for failing a game (only your successful scores are recorded), so if you don't get it right first time, try again! The Cube is designed to be fun to experiment with. You aren't supposed to win first time - the challenge is in perfecting your technique just like the real thing! There are 25 games in total, 17 are included and game packs are available as an in-app purchase. These instructions are for version 1.4. You must balance on the static perch by keeping the blue balance marker in the centre of the arc. If you are unable to remain in balance for a set time you will fail. A number of squares will appear on the floor of The Cube in a wave like pattern. All you have to do is calculate how many appear. 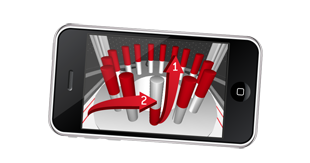 Starting from the red safe zone you must move your finger very slowly clockwise around the circular bar from one end to the other without moving too far from the bar. 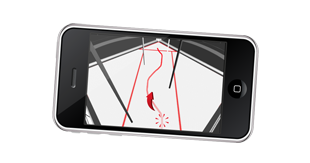 The game begins when your finger leaves the first red safe zone. 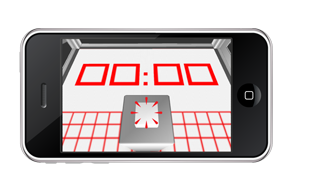 Your view will automatically follow your finger and speed up as your finger moves further from the centre of the screen. Move your finger around the circular bar. Your view will follow. Move your finger further to move faster. Do not take your finger off the bar until it is in the safe zone at the end. You must bounce the ball into the cylinder. 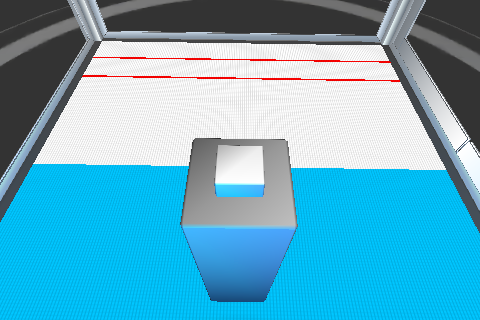 It can only bounce once before it reaches the target and you may stand anywhere in The Cube. The challenge starts as soon as you touch the ball. You must throw the ball into the third target container. To succeed you must bounce the ball once on each of the two columns. 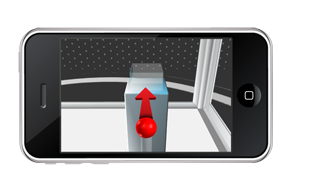 You will fail if the ball bounces more than once on each column or on any other surface. 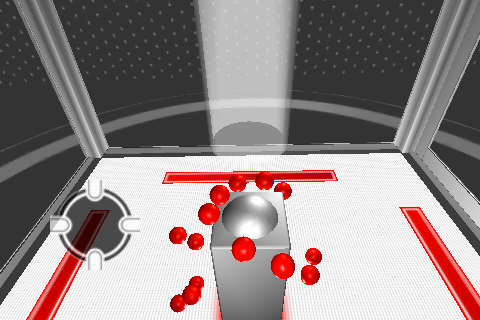 From the white box you must drop the ball directly into the small target container. You must press the button exactly 20 times within a set amount of time. If you run out of time or do not press the button exactly 20 times you will lose a life. Focus and speed are of equal importance. In quick succession 5 squares will briefly illuminate on the floor. You must memorise the location of the last one to flash up. 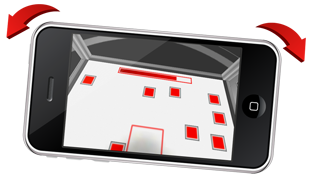 When the floor returns to white you must place the white box on the location of the last square seen. To succeed your box must fall within the final indicated area. You must turn all 15 cylinders over in a set amount of time. They must all be upstanding when the time is up. You will need to be fast but very controlled. If you do not swipe straight up the cylinder will fall. 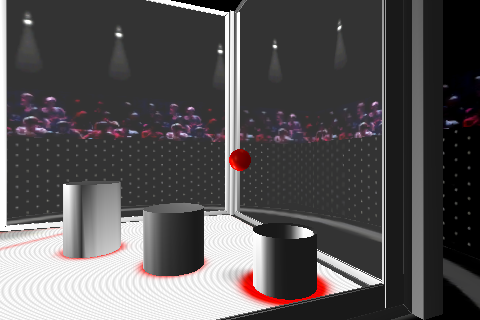 Lift the container to release 20 balls into The Cube. You have a fixed amount of time to pick them up and place them back in the container. They must remain inside the container to succeed. 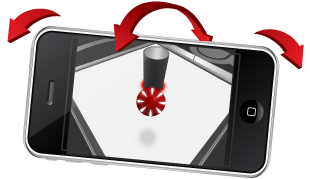 Move around The Cube: Drag your thumb on the black and white circular direction pad. Drag your thumb further to move faster. Blindfolded you must navigate your way around the poles without knocking any off. You must stay within the path and finish in the end zone. The slightest touch will dislodge the poles. Remember, the line you draw shows the centre of where you will walk and you must use your shadow to gauge your width. The floor will light up to display a path of arrows from one side of The Cube to the other. You have 5 seconds to look at it. The lights will then go out and you must remember and replicate the route. A square will travel at speed around the perimeter of The Cube. You must stop it inside the red marked box. Press the button to start and stop the square. You can take as long as you like to stop it but it must be within the box. 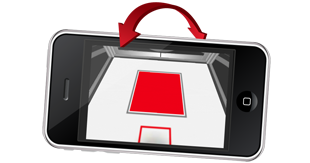 You must flick the ball and land it inside the square container. 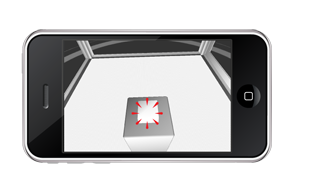 You must push the button to freeze the red pulse as it reaches the edge of the The Cube. The game starts on your first push of the button and ends on the second. You must push the button to begin the red pulse. Push again to freeze the pulse when it reaches the very edges of The Cube floor. You must count how many squares appear on the floor. You have only a set amount of time. Your time will start as soon as the squares appear. When they disappear then you must give an answer. 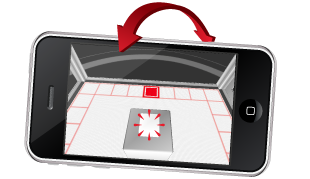 At any given moment the floor of The Cube will turn from white to red. As soon as this happens you must react by pressing the button. You must react within a fixed time to succeed. 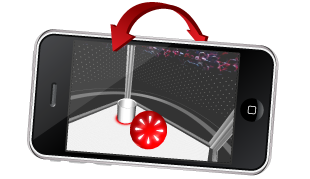 Whilst standing upon a revolving platform you must throw the ball into the target container. You will be spun round at speed. You must throw the ball so that it passes through the diamond and shatters the glass. You must walk the long beam on The Cube floor without falling off. You must land in the end zone to complete the challenge. 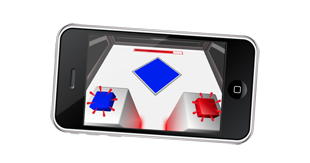 When you press the button an area of the floor will begin to turn blue then move at a consistent pace. When it reaches the centre of The Cube it will disappear but will continue to fill at the same pace. When you think it has reached the marked zone you must press the button again to stop it. You must stop it within the lines to succeed. You must complete a sequence in 10 seconds. 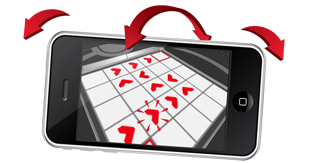 Each time a square appears on the floor, you must touch the button of the corresponding colour. If you press the wrong button or run out of time, you will lose a life. You must estimate the duration of 10 seconds. Press the button to start and stop the clock shown on the floor of The Cube. You have a fixed margin of error. A large red square will flash up on the floor of The Cube. You must count how many times it appears. You will need to maintain complete focus to win. You must re-stack the cubes on the other side of The Cube. You can only move one at a time and you have a fixed amount of time. 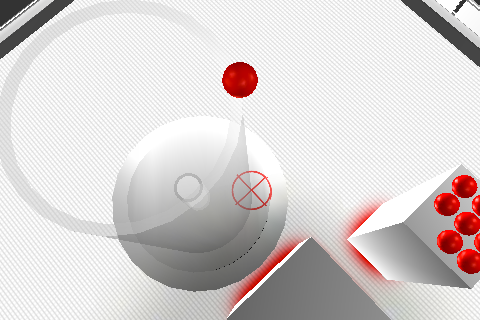 Because of the randomised nature of some games, it's sometimes possible for balls to become stuck. If this happens on an iOS device, you may need to fully close the game. Please follow these instructions: http://support.apple.com/kb/HT4211. This will not affect your game progress. The Cube ©2010 Objective Productions Limited. Under licence from All3Media International Ltd. Format created by Adam Adler. Voice of the Cube – Colin McFarlane. 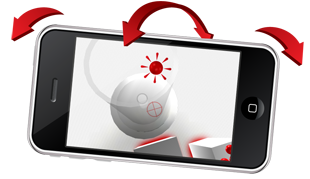 Game developed by Swipe Entertainment.